We were really impressed with the thought and detail that had gone into the session, which was fantastically run and the children really enjoyed. Children are already showing a clear understanding of the different experiences people have and the activities allowed most children to understand in a very empathetic way, while considering a topic they had likely never considered before. All the staff were wonderful with the pupils, managed behaviour well, and were successful in engaging every member of both classes. 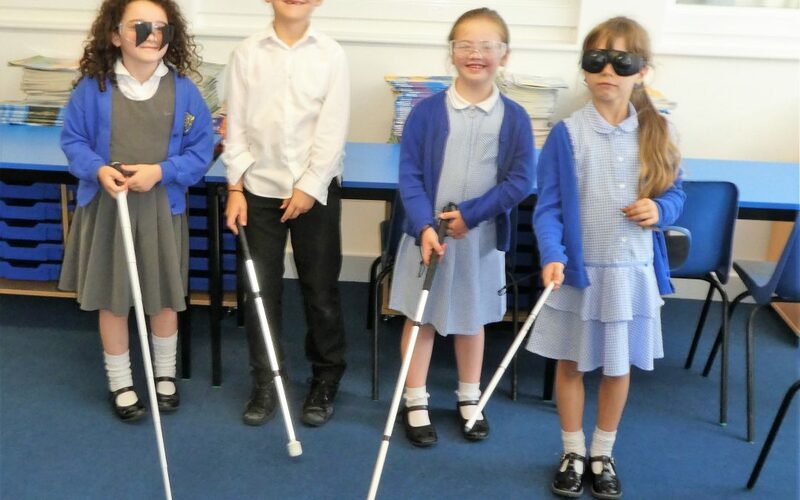 It was also great that they were able to meet role models to cement the message that visual impairments do not stop people participating in daily life. There was a good range of activities and children enjoyed the opportunity to question and experience the variety of tasks, which strengthened their understanding of the topic. Activities were appropriately timed to allow children to make the most of them without losing interest. In response to the question – “Did the images of VI people engaged in a variety of activities illustrate that VIs do not stop people taking an active part in life”, they said …..Yes, but having the opportunity to talk to Simon and Kate was more so. Meeting you yourselves was incredibly valuable in making this more real and relevant for the children. My class are in awe of Kate’s sailing!